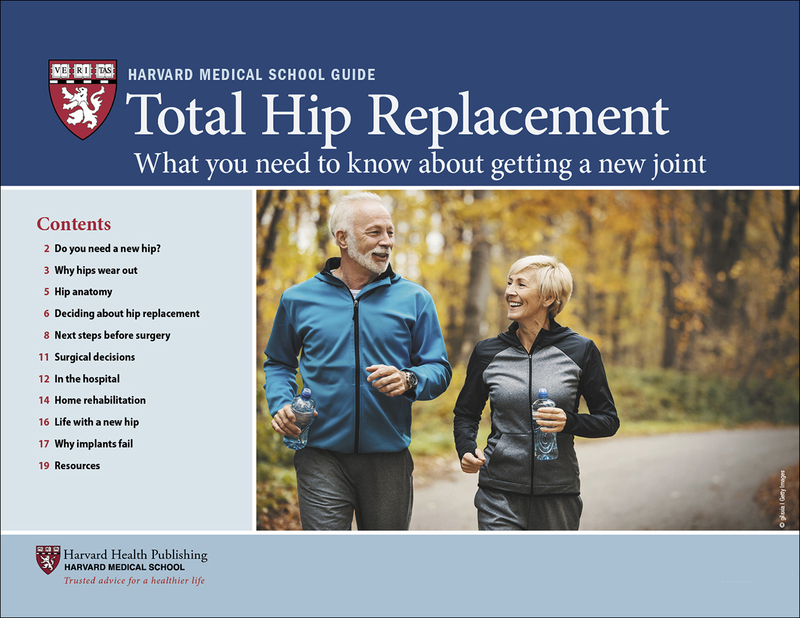 If you are wondering whether total hip replacement is for you, this Harvard Medical School guide can help you to make that important decision in consultation with your primary care doctor and orthopedic specialist. We’ll explain how your hips work and why people end up needing new ones. Inside Total Hip Replacement, you’ll also learn how artificial joints work, the many different types of hip implants, the alternatives to surgery, the risks and complications of surgery, and how to make a safe and full recovery. Do you often feel pain in the front of your hip or in your groin? A reduced range of motion in your hip? Is it difficult to stand up or walk—or even put on your shoes? These can be signs that your hip joint is wearing out. And while exercise, medications weight loss and physical therapy may help for a while, at some point your doctor may recommend a hip replacement. This is a critically important decision not to be taken lightly. Before you say “yes” it’s vital that you know exactly what’s involved…what options are open to you…how to minimize risks…plus the questions you must ask your doctor. That’s why you should consult Total Hip Replacement the eye-opening, in-depth online guide from the experts a Harvard Medical School. Have you exhausted these 6 other non-surgical options? Is the timing right? What objective criteria indicate that a replacement is necessary? Are you healthy enough? Are there viable alternatives to total hip replacement? How should you choose the best surgeon? What “prehabiltation” tips can help speed your recovery? What type of implant is best for you? What newer options might improve surgery results? What home preparations should you make? What surgical approaches are available? What type of anesthesia is used? What does the surgery entail? What does in-hospital recovery and rehabilitation look like? How do doctors decide when to discharge you? What precautions should you take? What are some at-home rehab exercises? How can you avoid post-surgery hip dislocation? When will you be able to drive again? Total Hip Replacement: What You Need to Know About Getting a New Joint is the convenient, one-stop online source for the answers you need to make the most informed decision about hip replacement. If a hip replacement is in your future, order this online guide today to help ensure the best possible outcome. Do you need a new hip? With aging, arthritis becomes the most common cause of hip pain and mobility problems. Other problems that lead to hip replacement include fractures and the death of bone in the hip. The most common type of arthritis is chronic “wear and tear” osteoarthritis. The hallmark of osteoarthritis is the age-related wearing away of the soft, slippery cartilage that coats the ends of bones and protects joints. Eventually, bones may start to rub against each other. This can cause pain, stiffness, and swelling that limits your ability to exercise, work, travel, and live independently. difficulty getting in and out of a car. on the hips while climbing stairs. weight. You can check your BMI using the calculator at www.health.harvard. • 40 and higher: extreme obesity. Excess body weight alone does not appear to cause osteoarthritis. However, once cartilage breakdown begins, the extra strain on the joints can accelerate the process. Research has also shown that obesity (a BMI of 30 or higher) raises the risk of complications from joint replacement, such as deep infections. Such infections are a leading cause of implant failure, which requires a do-over(called revision surgery) to replace the ailing joint. A practice guideline by the American Academy of Orthopaedic Surgeons recommends that people with a BMI of 40 or higher participate in a weightloss program before having total joint replacement. Research suggests that getting BMI below 35 can substantially reduce the risks of joint replacement linked to obesity. Because of these medical issues, surgeons may be reluctant to offer hip replacement to obese patients. On the other hand, even significantly overweight people experience a better quality of life after hip replacement because of reduced pain and improved mobility and independence. Hip fractures from falls typically occur near the top of the thighbone (femur). If the pieces of broken bone don’t move out of alignment, it may be possible to shore up the break with metal plates and screws to allow it to heal properly. 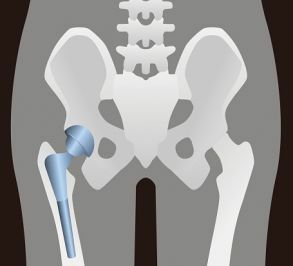 If the bone has moved out of place, your surgeon may replace the broken portion of the femur with a metal implant, a procedure called a partial hip replacement or hemiarthroplasty. In some cases, a broken hip can lead to a total hip replacement. A significant number of hip replacements in the United States are performed to treat a condition called osteonecrosis of the hip. Osteonecrosis means death of bone. It can happen when an injury, like a fracture or dislocation, reduces blood supply to the head of the femur. As a result, the bone dies and the head of the femur may partially collapse.